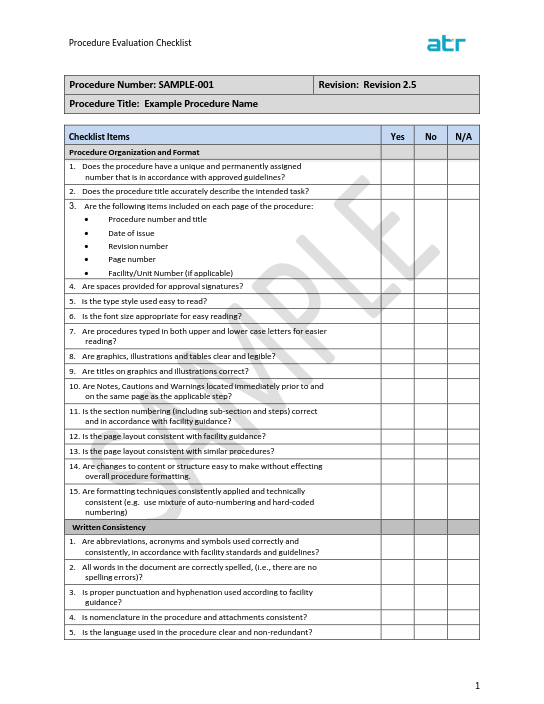 While SmartProcedure's powerful Step-Analyzer-Module (SAM) scours procedures for risk-based violations and provides a writing assist for the procedure writer, a thorough procedure review requires a subject matter expert to analyze the procedure for content quality and other infractions SAM is not able to evaluate. A standard evaluation checklist is provided to assist the writers or reviewers in their assessment. Is the purpose, objective or intent of the procedure clearly identified? Is the skill level necessary to perform the procedure clearly identified? Are the conditions that must be met prior to performing the procedure clearly identified? Are steps that must be performed in a fixed sequence clearly identified? Are Notes, Cautions or Warning statements clearly distinguishable from the action step? Are conditional statements easy to understand?